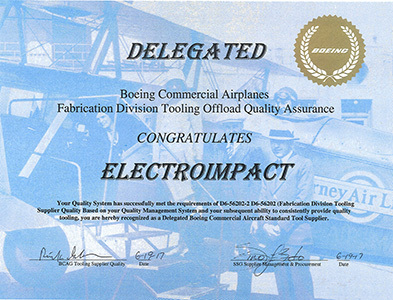 Your Quality System has successfully met the requirements of D6-56202-2 D6-5602 Fabrication Division Tooling Supplier Quality Based on your Quality Management System and your subsequent ability to consistently provide quality tooling, you are hereby recognized as a Delegated Boeing Commercial Aircraft Standard Tool Supplier. Joshua Cemenska, Todd Rudberg, and Michael Henscheid received the Arch T. Colwell Merit Award for their paper Automated In-Process Inspection System for AFP Machines submitted at SAE Aerotech 2015 in Seattle, WA. 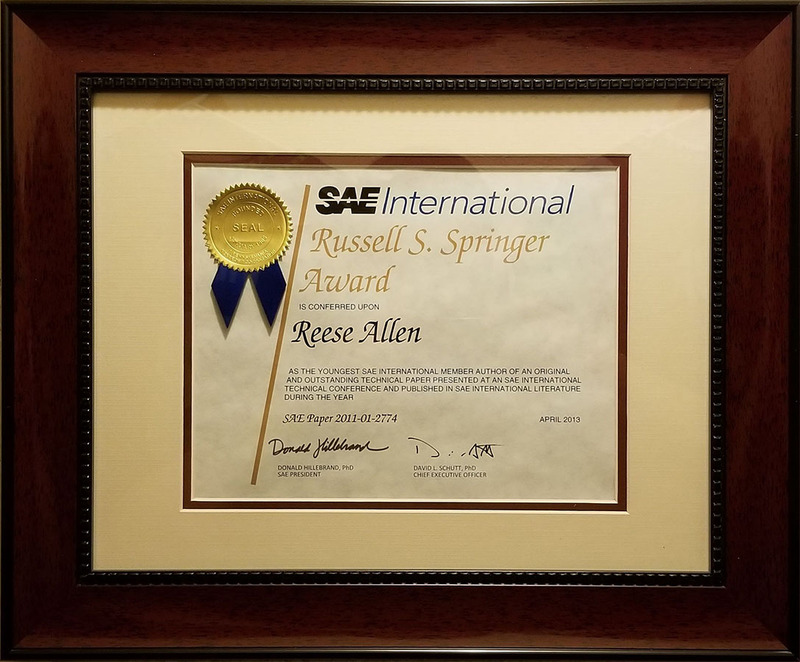 "This award annually recognizes the authors of papers of outstanding technical or professional merit presented at a meeting of the Society or any of its sections during the calendar year. Papers are judged primarily for their value as new contributions to existing knowledge of mobility engineering." 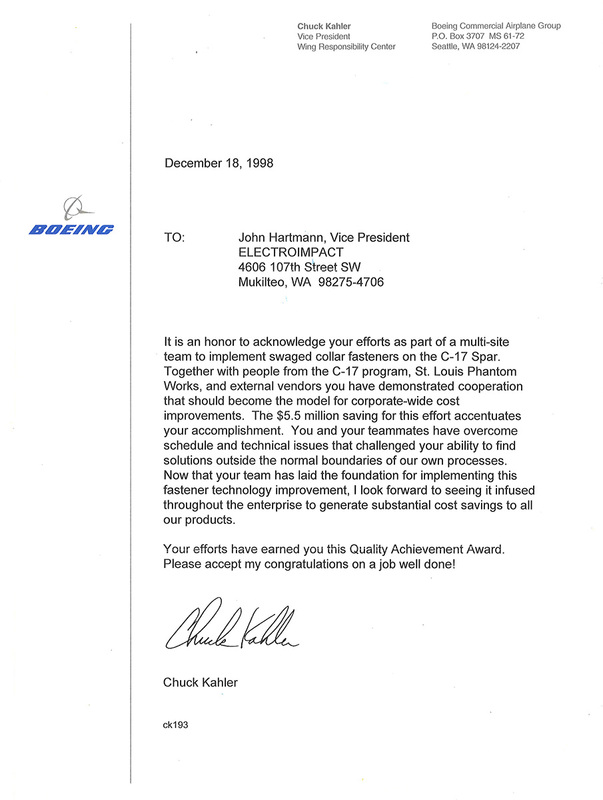 Mukilteo, WA, February 8, 2016 today announced that it has received a 2015 Boeing Performance Excellence Award. 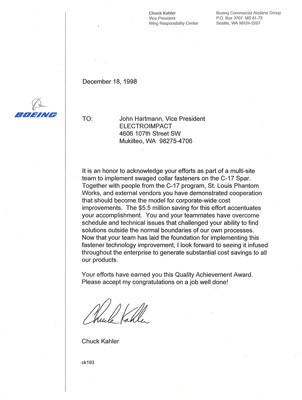 The Boeing Company issues the award annually to recognize suppliers who have achieved superior performance. 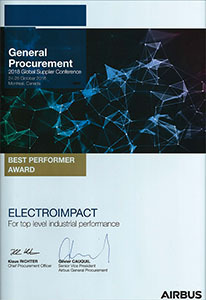 Electroimpact maintained a Silver composite performance rating for each month of the 12-month performance period, from Oct. 1, 2014, to Sept. 30, 2015. This year, Boeing recognized 530 suppliers who achieved either a Gold or Silver level Boeing Performance Excellence Award. 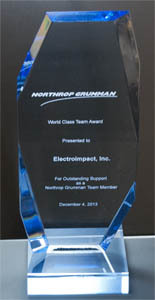 Electroimpact is one of only 423 suppliers to receive the Silver level of recognition. 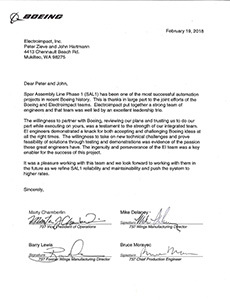 "Recognition of Distinguished Professional Achievement in Aerospace Automated Fastening Manufacturing and Processes"
Mukilteo, WA January 29, 2015 – Electroimpact, Inc. today announced that it has received a 2014 Boeing Performance Excellence Award. 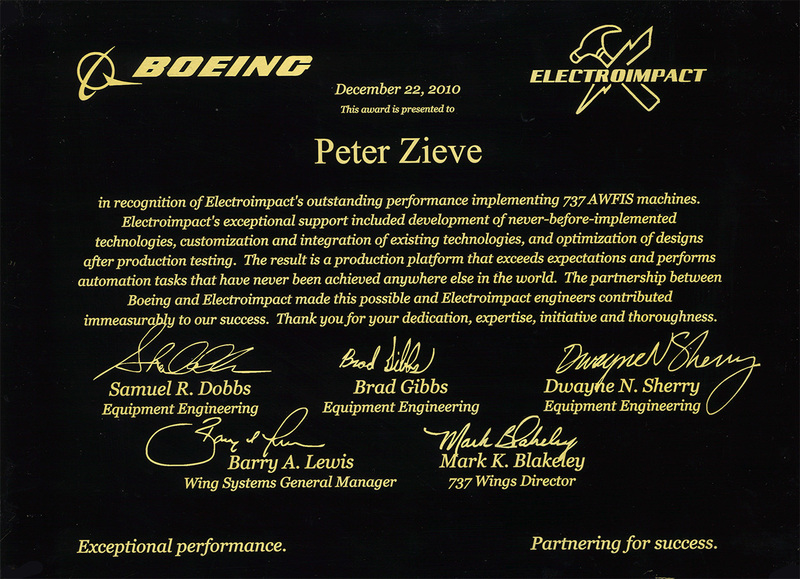 The Boeing Company issues the award annually to recognize suppliers who have achieved superior performance. 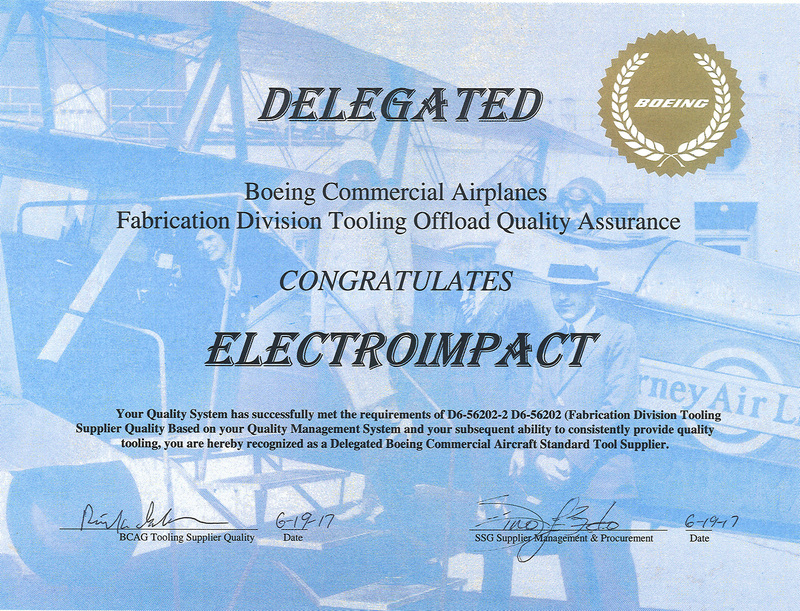 Electroimpact, Inc. maintained a Silver composite performance rating for each month of the 12-month performance period, from Oct. 1, 2013, to Sept. 30, 2014. 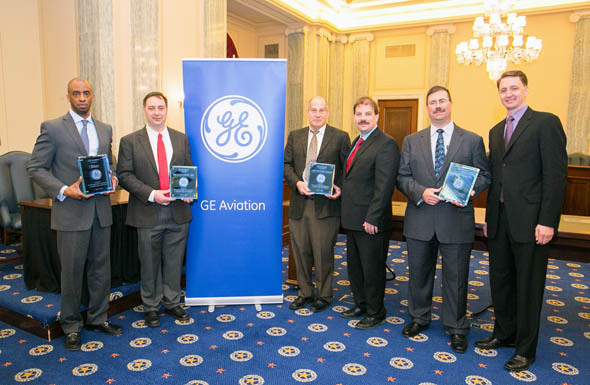 This year, Boeing recognized 548 suppliers who achieved either a Gold or Silver level Boeing Performance Excellence Award. 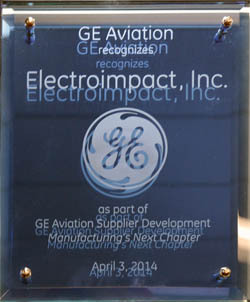 Electroimpact, Inc. is one of only 429 suppliers to receive the Silver level of recognition. Ethan Davies and Leigh Clarke represented Electroimpact at the 2015 World Skills UK Finals in the CNC Milling category. Both Ethan and Leigh did extremely well to make it to the finals. They did themselves and Electroimpact proud in how they acted and performed during the competition. 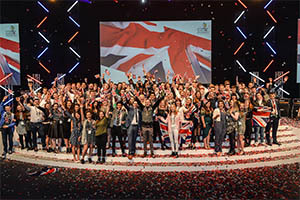 Ethan came away with the gold medal; he is the World Skills UK Champion! 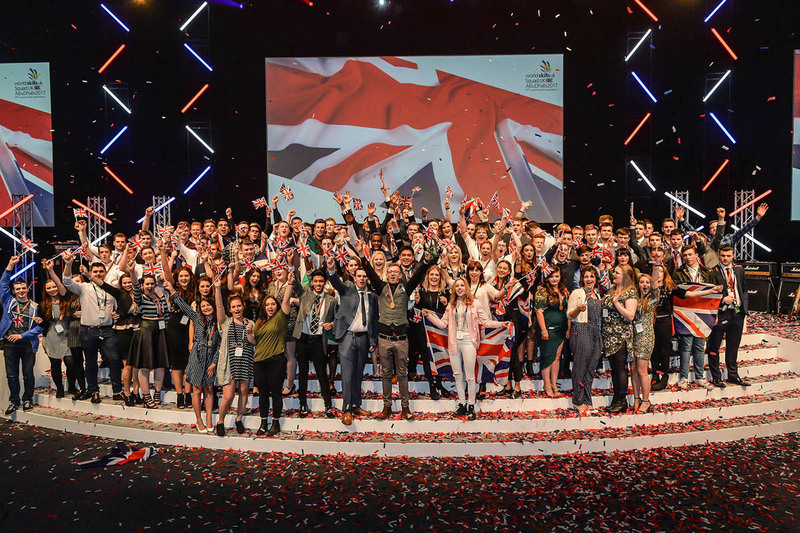 Ethan has been named as a member of the UK Squad and has a chance of making it onto the UK team to go and compete in the World finals in 2017. 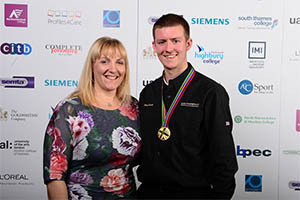 In addition to this gold medal, Ethan was also named IMech North Wales and North West Apprentice of the Year in October. On November 27, 2014 Electroimpact proudly received the Indirect Supplier of the Year award – Product Development category from Embraer for work on the E2 program. 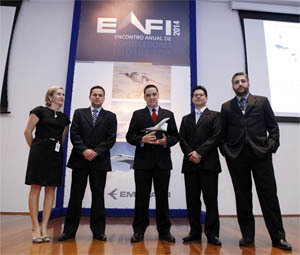 EI is supplying Embraer with a wing assembly line which includes state-of-the-art wingbox mobile tooling, as well as several EI Accurate drilling/fastening robots. 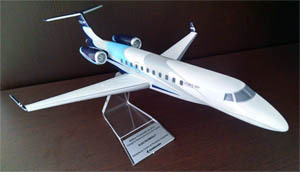 EI has also previously supported Embraer in the Legacy 450/500, E-190 E1 and KC-390 programs with extensive tooling and automation ranging from wingbox assembly to fuselage drilling machines. Electroimpact is proud to receive the Aerospace Company of the Year award from the Aerospace Futures Alliance. This award is given annually to a company recognized as making a significant contribution to the success and future of aerospace in Washington State. 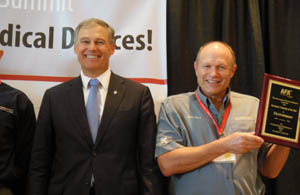 The award was presented to Dr. Peter Zieve, President of Electroimpact, Inc., by Linda Lanham, Executive Director of the AFA and Governor Jay Inslee at the 2014 Governor’s Aerospace Summit in Everett, Washington on October 1, 2014. Also present to receive the award were EI engineers and Leads Michael Assadi, Troy Gray, Ben Hempstead, and Todd Rudberg. 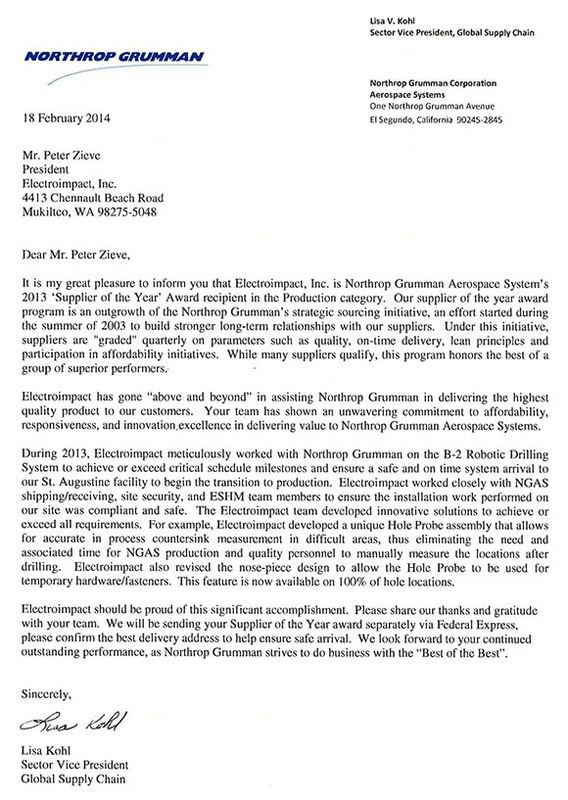 Northrop Grumman selected Electroimpact to provide an articulated arm robotic drilling system for drilling and countersinking highly curved high-strength metallic production aircraft panels at their St. Augustine, FL site. The size and complex contours that make up the OML of the product demand the automation cover a large volume and be capable of high articulation. An off-the-shelf 6-axis robot is utilized to which Electroimpact added absolute secondary feedback and integrated a single CNC to control the entire automation system. For a robot, the secondary encoders added to each axis output reduce backlash to negligible magnitudes. With highly descriptive kinematics, the accurate robot exhibits positioning accuracy on par with custom machine tools. On-part precision is maintained even with external forces (e.g. 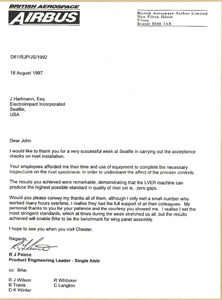 one-sided clamping, drill thrust) and within the working volume on-part accuracy was validated to be less than 0.010. A single multi-function end effector contains all the tools required to perform drilling and countersinking, hole inspection, automated vision-based feature recognition, one-sided clamp pressure, and auto-normalization. For roughly 90% of the product the sub-processes used include clamp up, normalization, drill/CSK, and hole inspection. Processes involving the vision system are used when features exist at the location already (holes, temporary fasteners). The majority of final holes and countersinks are drilled in one step from blank. In the end all holes are drilled and inspected in their full size condition using the robot. Offline programs and simulation of the drilling process are generated in the CATIA environment. 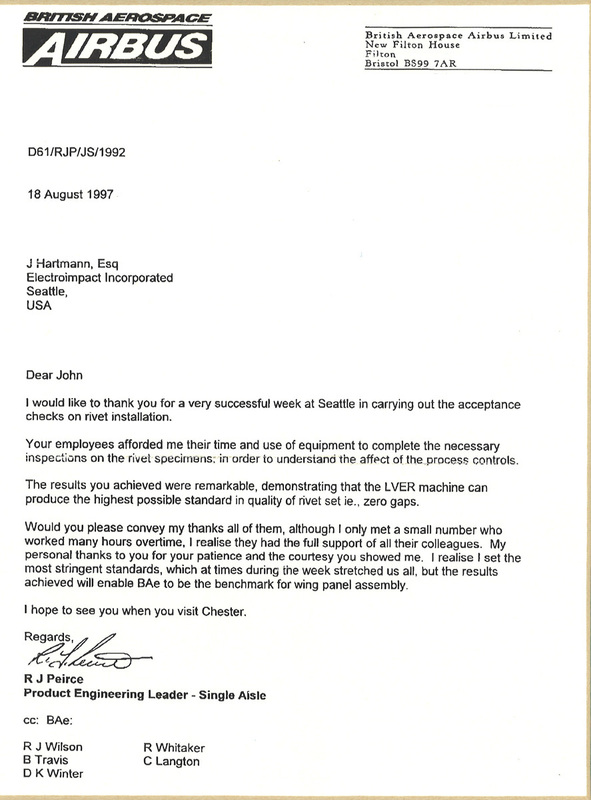 Prior to dry running the programs, the programmer is able to interrogate the 3D engineering assembly, associated fastener meta data, and observe the automation movement during a programmed process, check for collisions, and validate efficient robot motion and poses. To bridge the gap between CAD and the physical environment, the precise location of the jig relative to the robot’s coordinate frame is determined by automatically registering on tooling spheres surrounding the product with a spindle-mounted wireless touch probe. "In recognition of Electroimpact's exceptional organizational and management skills which set the industry standard for excellence in the Pacific Northwest Aerospace Industry"
The Pacific Northwest Aerospace Alliance has named Electroimpact the aerospace company of the year. 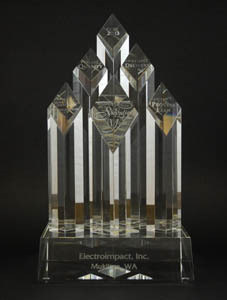 Electroimpact's unique company culture, philanthropic generosity, and commitment to innovation. The PNAA chairman, JC Hall, made the announcement at the annual conference held at the Lynwood Convention Center. 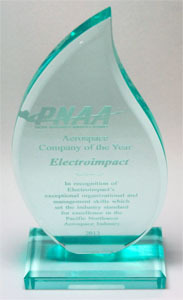 Read the full press release from the PNAA to see all the awards that were presented by the PNAA. As Electroimpact continues to grow within the UK and European markets safety has become paramount on all sites whether in a support role or installation. 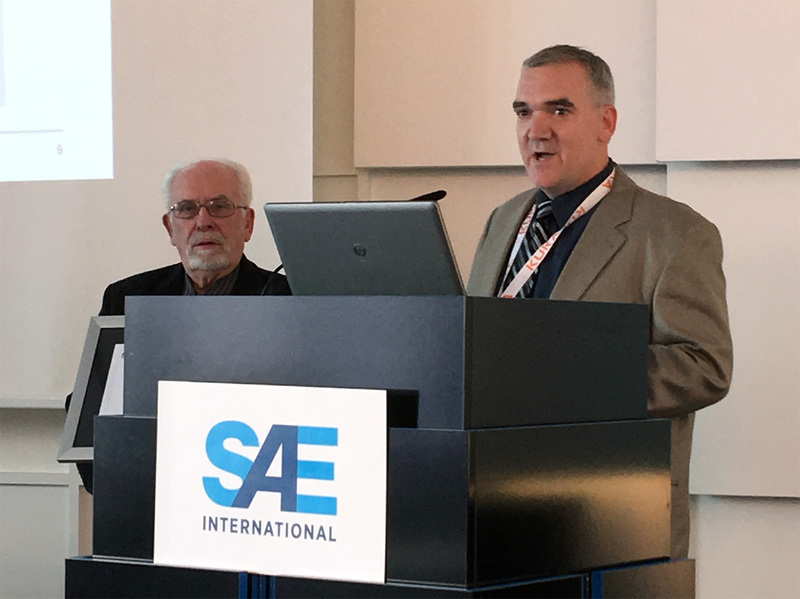 Throughout the Airbus A350 program Electroimpact had to adhere to a strict health and safety policy which often threw new challenges for the engineers to adapt to. Running side by side with the installation was the production support, this also threw new challenges with Electroimpact’s new dynamic risk assessment procedure in place, all Electroimpact engineers have been trained in this procedure so to adapt quickly to any breakdown or installation problems resulting in minimal down times and ensuring all site works goes smoothly and to schedule. 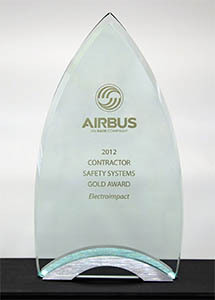 For this Electroimpact have been awarded Airbus’ ‘Gold Safety Award’. 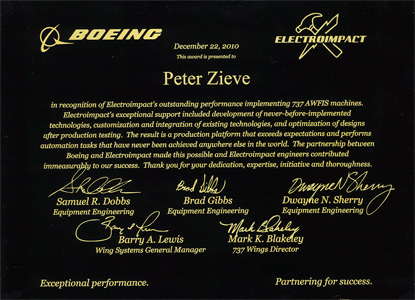 "This award is presented to Peter Zieve in recognition of Electroimpact’s outstanding performance implementing 737 AWFIS machines. Electroimpact’s exceptional support included development of never-before-implemented technologies, customization and integration of existing technologies, and optimization of designs after production testing. The result is a production platform that exceeds expectations and performs automation tasks that have never been achieved anywhere else in the world. 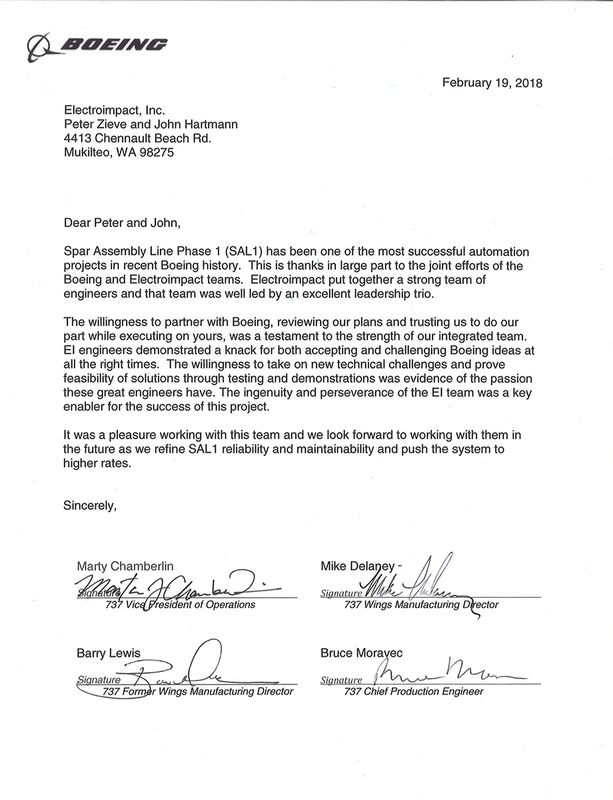 The partnership between Boeing and Electroimpact made this possible and Electroimpact engineers contributed immeasurably to our success. Thank you for your dedication, expertise, initiative and thoroughness." 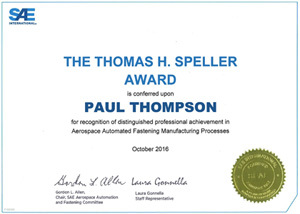 "In recognition of their contribution to the design and implementation of a Limpet countersink tool." 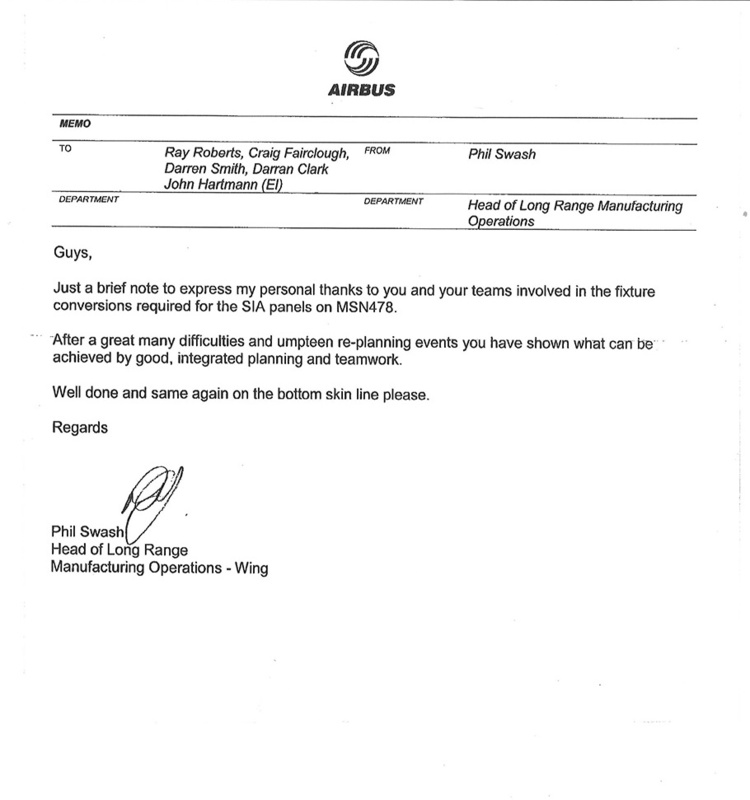 "In recognition of their contribution to the implementation of Horizontal Automated Wing Drilling Equipment (HAWDE) and Gear Rib Automated Drilling Equipment (GRAWDE) - Automation of Taperlok Drilling on A380"
After a great many difficulties and umpteen re-planning events you have shown what can be achieved by good, integrated planning and teamwork. "In Recognition of Outstanding Performance"
"In Recognition of an Outstanding Contribution to the SAE Literature Which Advances the Technology of Self-Propelled Vehicles Thereby Furthering the Objective of SAE"
For their paper:"New Generation Automated Fastener Feed Systems"
"Low Voltage Electromagnetic Lockbolt Installation"